Take commanding, tactile control over any parameter of your favorite music software with the QX49. Through a standard USB connection, the QX49 receives power while also transmitting MIDI data to your Mac, PC, or iOS* software or MIDI hardware device of choice. Punch out a drumbeat on great-feeling pads, open up a filter with smooth, tight knobs, or adjust volume and playback of sequencing software with long faders and snappy buttons. QX49's immense parameter control and velocity-sensitive keyboard get your hands off the mouse and into the action for a more efficient, visceral music-making experience. With a 49-note keyboard, the QX49's pitch range is perfect for performing with software instruments and samplers while still remaining highly portable. QX49 provides you with a full compliment of controls including pitch and modulation wheels, octave up/down buttons, and the ability to send program changes directly from the keys. 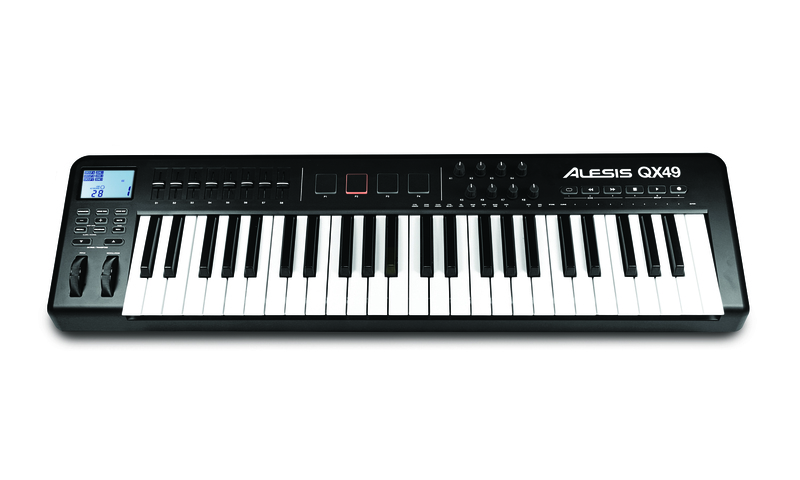 The keyboard can even be split into sections to control multiple instruments at once. 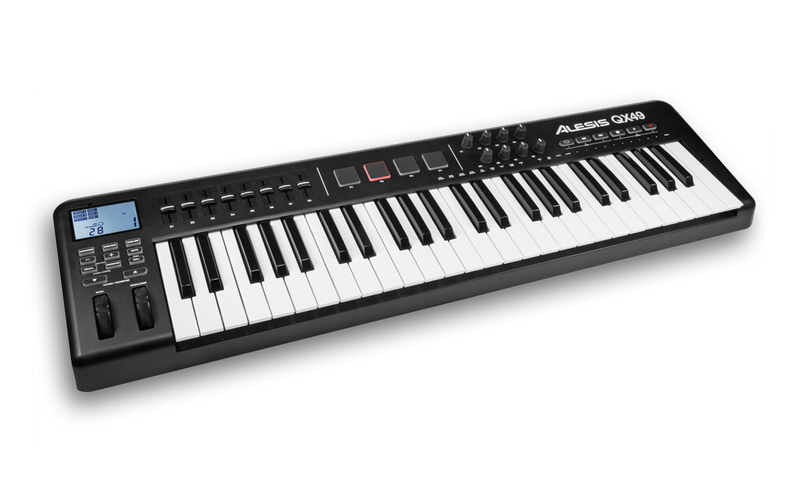 The QX49's array of assignable controls work with virtually all music software and MIDI hardware devices. Whether you're looking to fire drum samples, tweak a software synthesizer or adjust individual tracks in a mix, the QX49's extensive layout ensures appropriate feel and proper response with its eight sliders and rotary knobs, four backlit drum pads, and dedicated transport controls. The compact controller features USB MIDI for easy connection to Mac, PC and MIDI hardware. The QX49 also has two traditional MIDI jacks: one for sending MIDI data directly from the keyboard and the other for routing MIDI data from a connected computer. 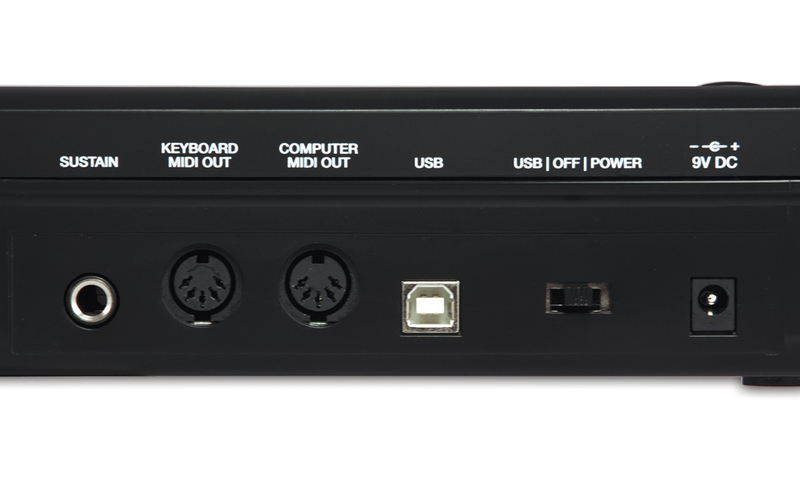 When not using a computer, the QX49 can also be powered using a wall power adaptor (sold separately) to perform and control MIDI hardware. A footswitch input is also included on the back panel. The QX49 comes with a copy of Ableton Live Lite and AIR Xpand!2 software for performing, recording, and sequencing music right out of the box. The QX49 is also the perfect choice for controlling hardware MIDI devices. Its compact size and portability make it ideal for fitting into existing rigs and then hitting the road. Place it a tier above an existing workstation keyboard and utilize QX49's streamlined layout to maximize your sound and performance options. Dimensions: (WxDxH) 32" x 9" x 3"